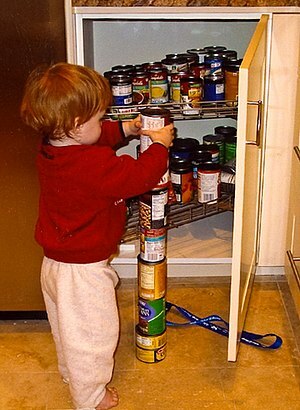 Repetitively stackin or linin up objects is associatit wi autism. Autism is a neurodevelopmental disorder chairacterised bi impaired social interaction, impaired verbal an non-verbal communication, an restrictit an repetitive behaviour. ↑ 1.0 1.1 "NIMH » Autism Spectrum Disorder". nimh.nih.gov (in Inglis). October 2016. Retrieved 20 April 2017. ↑ Chaste P, Leboyer M (2012). "Autism risk factors: genes, environment, and gene-environment interactions". Dialogues in Clinical Neuroscience. 14: 281–92. PMC 3513682  . PMID 23226953. ↑ Corcoran, Jacqueline; Walsh, Joseph (9 February 2006). Clinical Assessment and Diagnosis in Social Work Practice. Oxford University Press, USA. p. 72. ISBN 9780195168303 – via Google Books. ↑ Myers SM, Johnson CP (2007). "Management of children with autism spectrum disorders". Pediatrics. 120 (5): 1162–82. doi:10.1542/peds.2007-2362  . PMID 17967921. This page wis last eeditit on 4 November 2017, at 23:04.